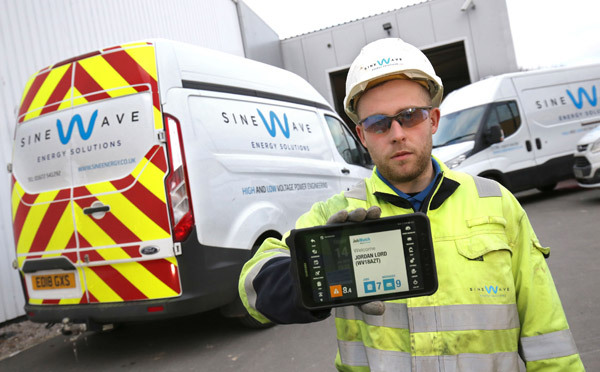 Leeds, UK, 13th February 2019 – High and Low Voltage Electrical Engineering company Sinewave Energy Solutions has boosted its field installation and service operations with a 5 in 1 mobile workforce system from BigChange. The cloud-based JobWatch solution combines mobile apps and real-time tracking, connected seamlessly to back office software including job booking and scheduling, CRM and invoicing. Sinewave is already saving 2000 hours of engineer time annually by replacing paperwork with digital data entry on BigChange tablets. Sinewave is involved in power distribution connecting infrastructure to the electricity network and undertaking the work needed to provide power to anything from an office, to factory or sports stadium. Established in 2015 and growing rapidly, doubling in size for each of the last three years. The Swindon-based company offers a complete end-to-end solution from design to network connection, construction, testing and commissioning and ongoing maintenance and servicing. The JobWatch system has been implemented, initially within Sinewave’s Operations and Maintenance (O&M) Division. Previously largely paper-based with data held on various spreadsheets, the entire process has now been automated with jobs booked and scheduled, routed, completed using the BigChange tablets connected in real time to the back office applications.